Summer is a time for backyard fun. But as everyone in Cincinnati has experienced, sometimes that backyard fun can be ruined by swarming mosquitoes. Whether you’re grilling for dinner or just trying to relax those nasty blood suckers can have you racing indoors. It doesn’t have to be that way especially when there are so many helpful hints out there to prevent mosquito bites. Have you tried these? Citronella: This is a popular method for repelling all kinds of bugs. The special scent found in Citronella candles and torches keeps the bugs away for as long as they are burning. Repellent Sprays: There are plenty of repellent sprays on the market which can be equally effective. Some folks would prefer a natural repellent that they know will be safe. Listerine: Yes, that same thing you use to garble with can scare off the mosquitoes. When you sense the bugs swarming, spray a mist of Listerine and water from a spray bottle in the direction of the bugs. They’ll go running. Lemon: In this case the lemon you should use is lemon thyme, lemon grass or lemon balm. The leaves of those plants are not a favorite of the mosquitoes. Light colors: Believe it or not, dark clothing colors like black, navy blue or dark green actually attract mosquitoes. So, if you’re going to be hanging outdoors, the brighter and bolder the better when it comes to clothing choices. Getting rid of mosquitoes isn’t the only item on your “prepare for summer” to-do list. 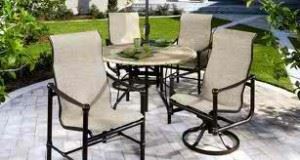 What about your patio furniture? Chances are you’ve kept your furniture outdoors all winter and it took a pretty good beating. Patio furniture is design to weather all kinds of storms by through the years even the sturdiest of chairs and tables could end up rusting or falling apart. This is especially true if your patio furniture choice is any type of wicker or wood. If you’re ready to swap out your old furniture for new pieces then you should consider hiring a group of professional junk haulers to get the job done – Junk King Cincinnati. These junk haulers will have no problem tossing your old patio furniture onto the back of their big truck. You could also direct them to toss a lot of other junk onto that truck. From the backyard, you might also be looking to replace the old grill. There could be piles of dirt, pieces of broken concrete or scraps of lumber. Anything you want gone can be gone with Junk King. They can also help you clear out your garage, basement, attic or any other area in your home that has junk it shouldn’t have. This type of total home sweep out is a great way to start the summer. Just remember, working up a sweat will also keep away the mosquitoes but the only ones who will be doing that will be those junk haulers. You stick with the Listerine! This entry was posted in Cincinnati Furniture Disposal, Cincinnati Junk Hauling, Cincinnati Junk Removal, Cincinnati Recycling, Junk King Cincinnati and tagged Cincinnati Furniture Disposal, Cincinnati Furniture Removal, Cincinnati Hauling on May 30, 2012 by Peter Mccreary. Last updated August 2, 2017 .